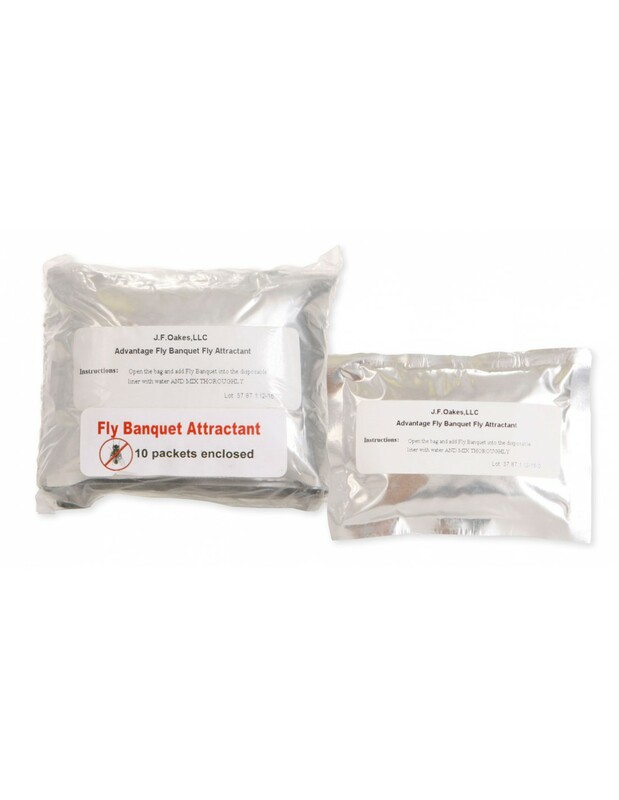 Advantage Trap Fly Banquet lures a wide variety of flies: Stable flies, blow flies, house flies, sludge flies, blue/green bottle flies, large gnats, etc. * Simple to use - just add water! * No harsh odors like pheromones. * Lures a wide variety of flies - Stable flies, blow flies, house flies, sludge flies, blue/green bottle flies, large gnats, etc. * EPA exempt - no restrictions to adhere to. * No poisons - safe to use around people and animals. * No chemicals - environmentally safe. * All natural ingredients - contains chicken, fish, natural herbs & spices. 4. Allow 24-48 hours to fully activate. 5. Remove & dispose of trap liner when full of dead insects, (every 10 days or as needed). Lures a wide variety of flies - Stable flies, blow flies, house flies, sludge flies, blue/green bottle flies, large gnats, etc.